The automobile and the filling station have become an integral part of everyday life. Although the use of fossil fuels are at the core of environmental challenges globally, designers and large organizations, like TOTAL, are working together to re-imagine and transform this industry to address the environmental challenges facing current and future generations. The filling station is a place to re-energize, whether it is refueling your vehicle, filling your stomach with food and drink or feeding your body and soul with some quick rest and relaxation. The services provided are centred on people, and more than ever before, the environment as well. 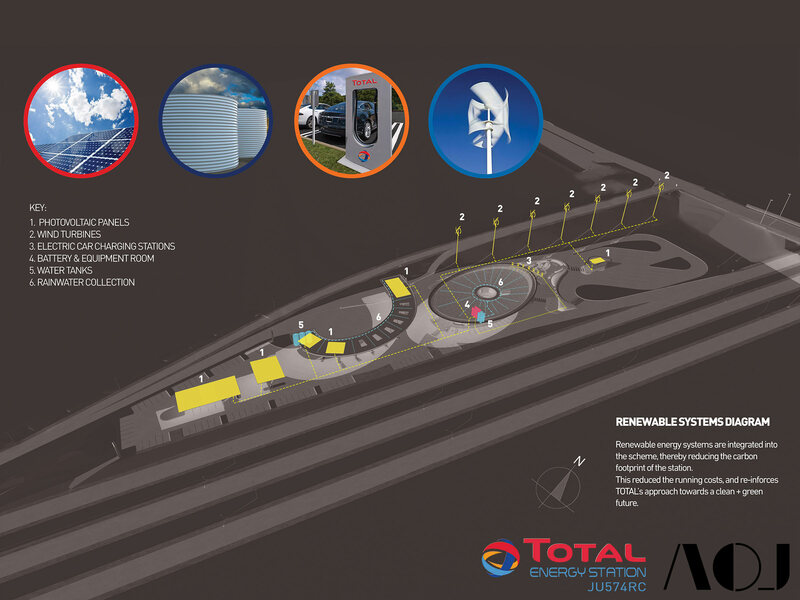 A progressively designed filling station needs to be focused on reducing the resources required to operate it, the production of clean energy within it and the provision of a convenient, comfortable and unique user experience. 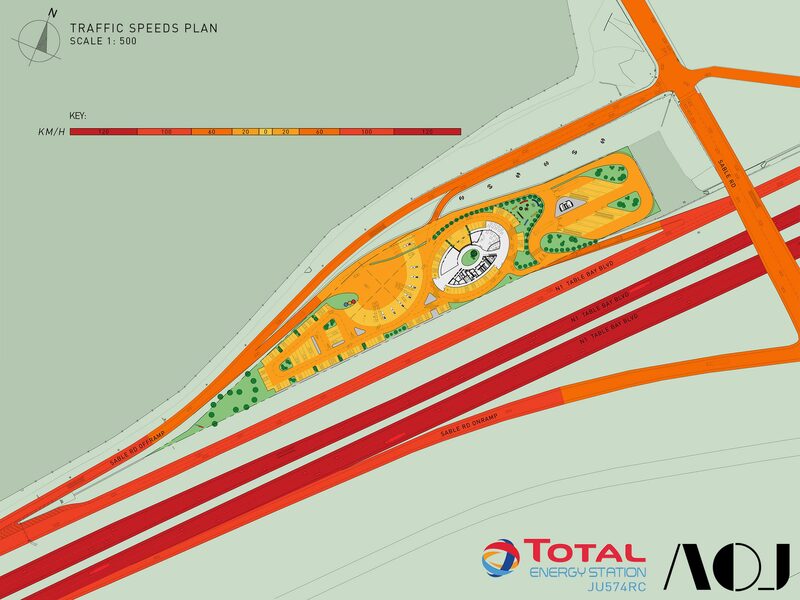 AOJ’s proposal for this mainline Petroport in Cape Town, achieves this through the integration of hybrid green technologies, passive design strategies, smart traffic flows and visually striking architecture. 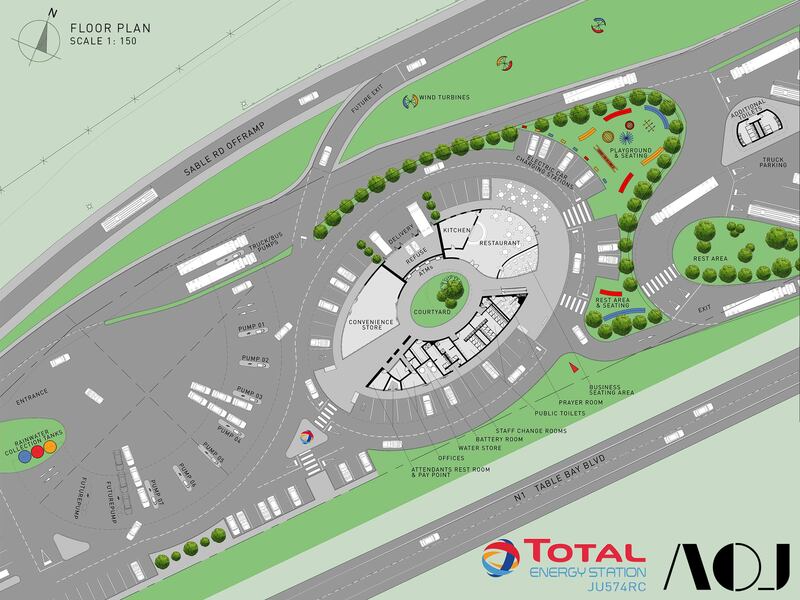 This TOTAL Energy Station, efficiently organizes cars, trucks, pedestrians and buildings on the narrow and difficult site to optimise the use of space and provide as much green space as possible. The built forms have been shaped by the movement of people and vehicles – into, out of and within the service station – boosting the efficiency of the scheme. 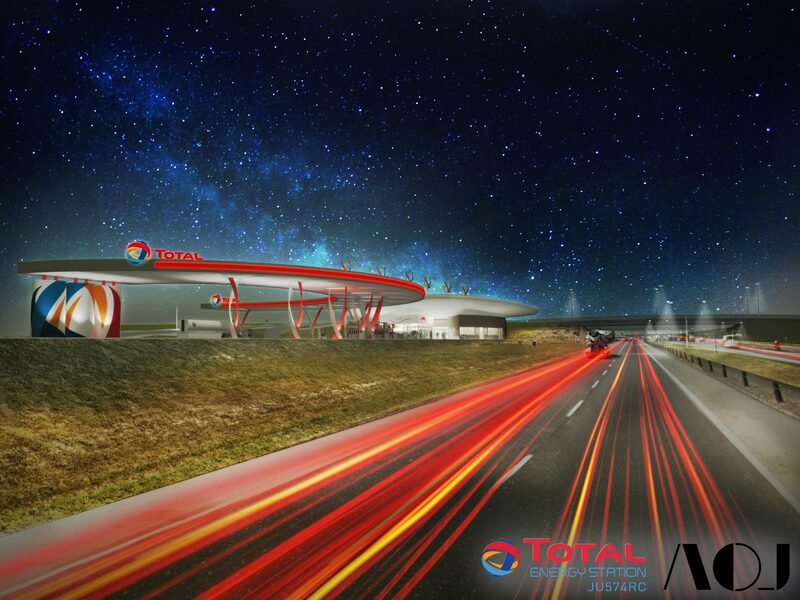 Whether you are pulling in quickly to refuel, you are stopping to take in the magnificent view of Table Mountain, in the distance, or you are simply going about your daily routine, this newly conceived TOTAL Energy Station caters for all of those needs. 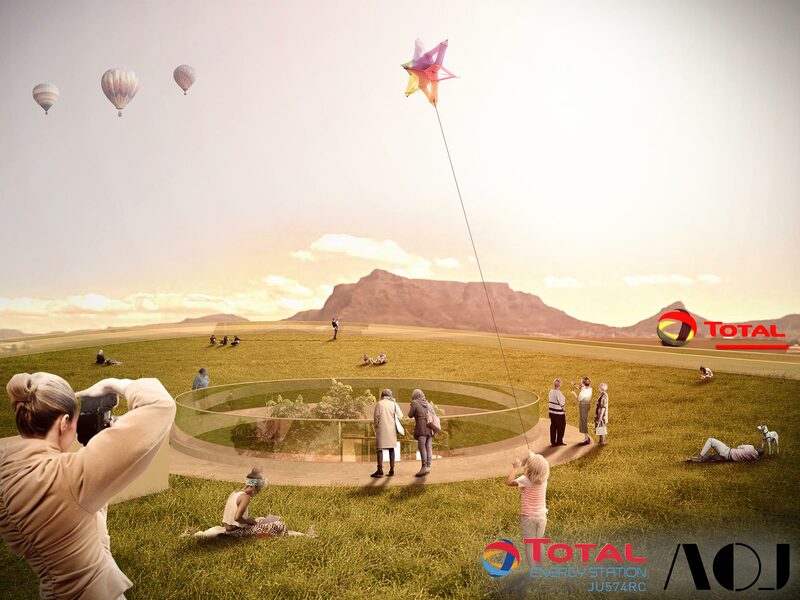 The proposal brings about TOTAL’s vision of the future, today. Roofs are designed to collect water for irrigation and flushing of toilets, are fitted with photovoltaic panels to charge batteries to supplement electrical consumption and are a safe planted environment for people to remove themselves from the busy and stressful highway experience. Wind turbines located along the perimeter of the site generate additional power and create a visual awareness of TOTAL’s commitment to renewable energy solutions. 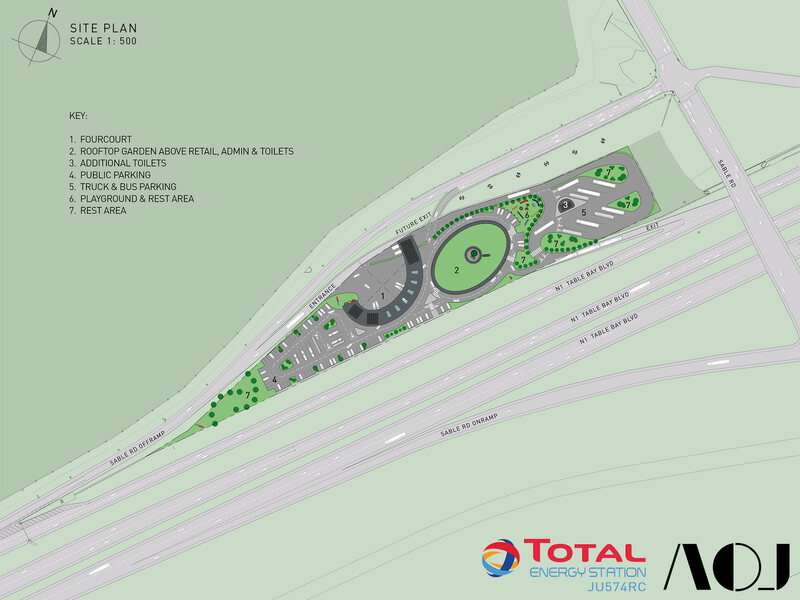 Electric car charging stations, near the restaurant and play area, are a further indicator of an ongoing transformation within the motor industry. 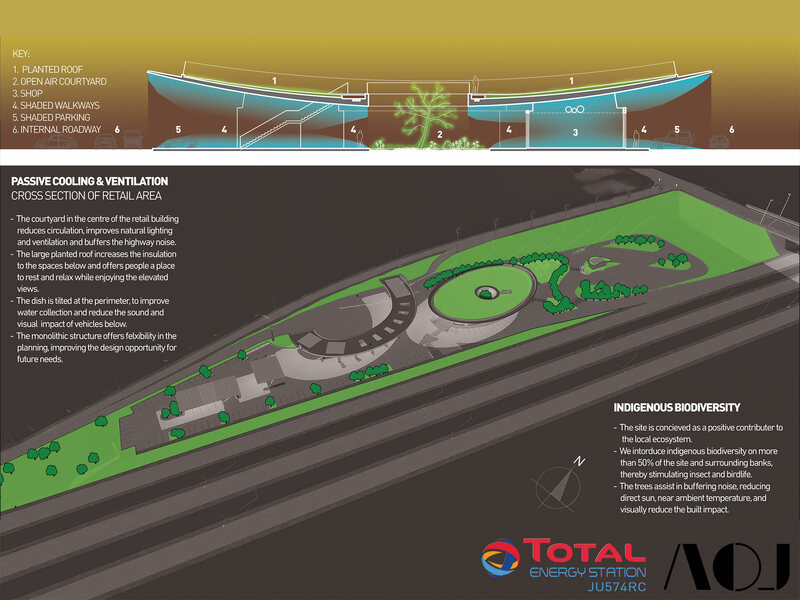 Environmental consciousness is placed at the fore of this scheme by making these eco-focussed systems visible to the user and passer-by throughout the scheme. 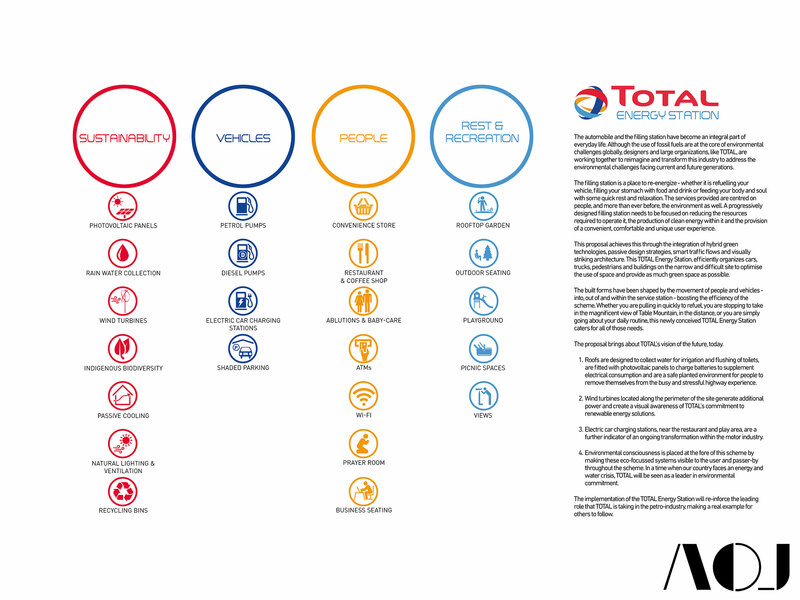 In a time when our country faces an energy and water crisis, TOTAL will be seen as a leader in environmental commitment. 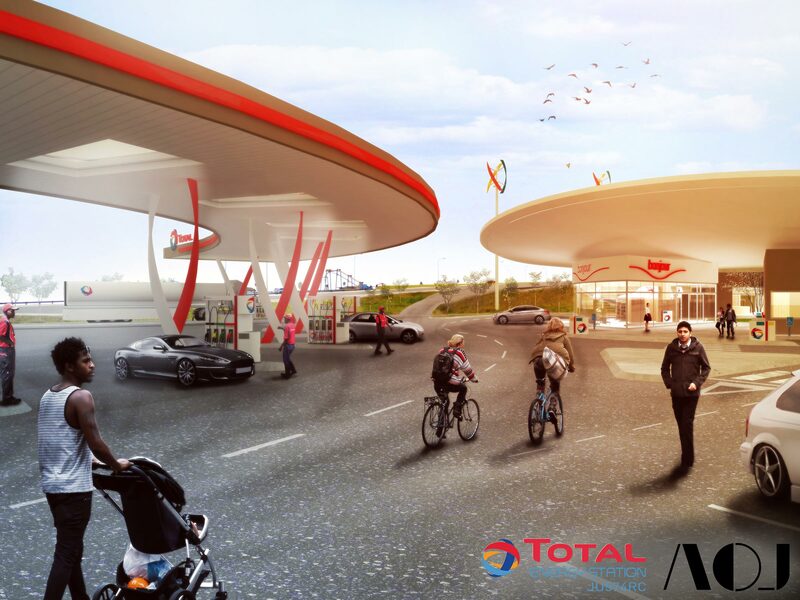 The implementation of the TOTAL Energy Station will re-inforce the leading role that TOTAL is taking in the petro-industry, making a real example for others to follow. Drawings and Renderings courtesy Architects of Justice.